Your a super secret muffin rater. nuff said. Your favourite arcade classic. But this time, it's with chicks!!! A Match-3 2D Survival Shooter Entry for Ludum Dare #41. I did have "Mobile" in mind for this game. It is something, I am considering. I think i misunderstood. So the only way to brake is to grab hold of a sign using the magnet. Gotcha. Goegeous graphics. And high speed rollercoaster fun. I did feel that the ending of the game was odd. I was expecting something like "Well done, you earned 500 gold. Play Again?". Another thing to note is the feedback upon braking. When I pressed the mouse to brake, I was not sure whether I was breaking or not. Perhaps some audio feedback as indication would help? Really fun game and quite a great idea. Theres a few unpolished stuf, which is understandable given the time limit. Like the players not having eyes in the stages, The player getting stuck on walls (probably something to do with physics material) and the camera shake when rotating the world, which only happens sometimes. This didn't affect the gameplay much at all. Cool game. Really neat concept. Sometimes the character can throw the ladders way too far. Liked the level progression also. its just as hard on the phone lol. Its playable in phone browser but because of the resolution - some of the screen edge is lost. I totally agree Taldius. It needs a smartphone port. I'm gonna test to see if the browser game works on my phone. Thanks. Transitions and visuals are really nice. Music very soothing. I think you've achieved the "relaxing" mood that you were aiming for. Controls and menus are intuitive. I did notice the change in art as the game went on. I think some sort of feedback when collecting the plastic would give it more of a nicer touch (its already a nice game anyways). Many thanks for playing my game. I would really like to know whether you found my game rhythmic or not? Nicely done. Like your choice of graphics and atmosphere. handling the boxes are a bit clunky but thats expected due to the timeframe. I like the way the player moves. Are you using the unity stovk FP controller? The levels are easy but its good to start of with easy levels then gradually increase in difficulty later on, I believe. Do you have plans to continue developing this game with more polish? I like the idea of the game. Haven't run into any game-breaking bugs yet either. Its a great platform to build upon. Regarding getting stuck on the wall, have you tried modifying the physics2D material on the frog (assuming that the frog has a Rigidbody2D attached to it). My First Game Jam: Summer 2018 community · Posted in [ ! ] Post-Jam Playtesting! Share your games here! Pitch/Information: A Relaxing Musical Experience set Deep underwater. A score-based beat rhythm game. I need help on: depends on the feedback. 1. A crosshair would be great (like the one you see in FPSs) for aiming. 2. A checkpoint system after each island or two, because starting all over again can get repetetive. A well written story and nice visuals. Great first game!! Very creative idea. I notice the fine touches such as the droplet animation when moving sideways and the gradient shift in the background. The sound is fitting and you can make it sound ambient by periodically raising and lowering the volume. Also, I didn't feel that the game got any harder as my score went up. A solid platformer as afirst game. Congrats. If you were going for the Super Meatboy type of game - then this fits the bill :). I did find that 3-4 lvels in - there was a jump in difficulty, which might make some people rage quit. glad to hear that you enjoyed. Thank you for your constructive feedback as well. You do raise a good point about explanation. Do you understand how to play? What additional content would you like? Do you want to play it on your phone? Is there anything else I can do to help your experiance? I need help on: If you know any documentation relating to using your own MP3 file to play within this game (android). Its a bit technical but if you can lead me in the right direction -- Your a star!!! 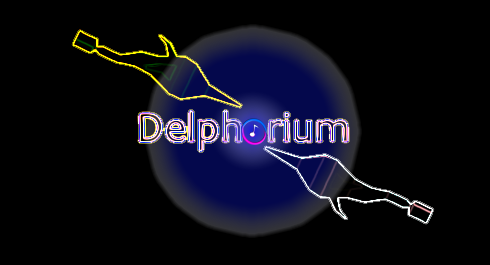 It's called delphorium and it is a Relaxing Musical Experiance. Sorry for the lack of devlogs, I've been busy with life and other stuff. I may plan a post-mortem though in the future. I plan to add far more content to it. It is, at the moment, fairly barebones with not many other features apart from gameplay. However, I plan to add more features - dependant on feedback. This is a short-term project and I plan to release the game within 2 months. In the meantime, I plan to play all the other entries in the jam. Try the game out and do leave me your feedback. This'll be the first time, that I will attempt to make a 3D game. So far I have modelled a dolphin in blender and made it wiggle in Unity. Im thinking of a rhythm based game underwater. Next up, I'll write some code in unity. Its late and slow.. but better than nothing. Follow me for regular updates and let me know if your post updates too and I'll follow back. The art is great. I wanted to slash these red things but everytime i do it, i lose health. The game is buggy but then again it does seem you ran out of time. Great work - on the art in particular. I like the fighting/combat mechanic really well. It was difficult to know whether I was doing damage to the first boss/tree or not. I was sure that "bash" did damage and "defend" is self-explanatory. However, i wasn't 100% sure what the other options do. A good platformer but controls are a bit floaty. Good work. I understand the idea and would like to see you finish it. Looks like you ran out of time. I do like the visual presentation though. I feel the time limit is too much. ie there is a 3 min time limit for a level than can be beaten easily within a minute. I was under the assumption that there was no sound until i pressed the options button. If the options is just for sound, then have the sound slider on the menu screen. + Have sound ON as default. UI buttons and graphics are too small. Gameplay works and is simple and solid. Good work. Nice audio and visuals. I understand the mashup. Hope to see it expanded. The game definately has a PS1 feel to it 100%. Very artistic. Pixel art is good and the choice of music is gr8 too. Thank you for reporting the bug sand feedback. Also, I would be glad if you kindly listed all the bugs. Nice mashup. Hope you expand and add more levels!! Nice mashup. Very enjoyable and quite challenging also. Reminds me of the Talos Principle.